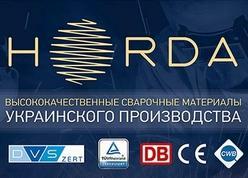 HORDA® welding wires are produced by LLC VITAPOLIS. Production programme includes the most popular welding wires for semi-automatic and automatic welding. The wires for carbon and low alloy steel welding, high strenght steels, stainless and heat resistent steels, armour steels. All of products is manufactured on the modern europian equipment. А modern technology of manufacturing stainless and copper-free polished welding wires was realized for the first time on the territory of Ukraine. HORDA® wires is supplyed according to EN, ISO, AWS standards as well as to specific customers requirements. Under production the solid wires 0,8; 1,0; 1,2; 1,6; 2,0; 2,4; 3,0; 3,2; 4,0 mm diameter on BS200, BS300, K415 spools with precission wind, packed with EN ISO 544 standard conditions. 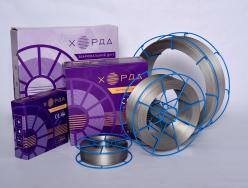 2,0 mm and bigger wire diameters can supply in reels up to 1000 kg. For robot complexes we offer 0,8 - 1,2 mm wire in cardboard boxes "DizhkaPack" 200, 250 and 500 kg mass. The quality management system of our manufacturing plant complies with ISO 9001 and is certified by the DVS Zert center. VITAPOLIS company has received the right to mark HORDA® wires with CE mark after appropriate qualified tests and manufacturing process audit by TÜV RHEINLAND. The wires HORDA 3Si1 and HORDA 4Si1 are tested and certified by PATON-CERT. All of VITAPOLIS consumables have UkrSEPRO certificates.